The lineup for the 2017 Rock on the Range Festival has been announced, and once again it has proven to be quite the collection of acts. The three-day festival will be headlined by Metallica, Soundgarden and Korn. It will feature more than 50 bands over the course of that time along with some of the country’s top comics at the festival’s Rock on the Range Rolling Rock Comedy Tent. The lineup for the 2017 Rock on the Range Festival includes: Metallica, Soundgarden, Korn, The Offspring, Volbeat, Primus, Bush, Chevelle, Papa Roach, Seether, Coheed & Cambria, Alter Bridge, The Pretty Reckless, Taking Back Sunday, Thrice, Amon Amarth, Pierce The Veil, Sum 41, Skillet, Dillinger Escape Plan, In Flames, Gojira, Biffy Clyro, Motionless In White, Nothing More, Beartooth, Starset, Every Time I Die, The Story So Far, Deafheaven, Zakk Sabbath, Rival Sons, The Amity Affliction, Attila, Norma Jean, Suicide Silence, Whitechapel, I Prevail, Turnstile, Dinosaur Pile-Up, Red Fang, Dorothy, Kyng, Radkey, As Lions, Frank Carter & The Rattlesnakes, Sylar, Fire From The Gods, Badflower, Wage War, Goodbye June, Cover Your Tracks, DED, Bleeker, Royal Republic, Mother Feather, Aeges and One Less Reason. 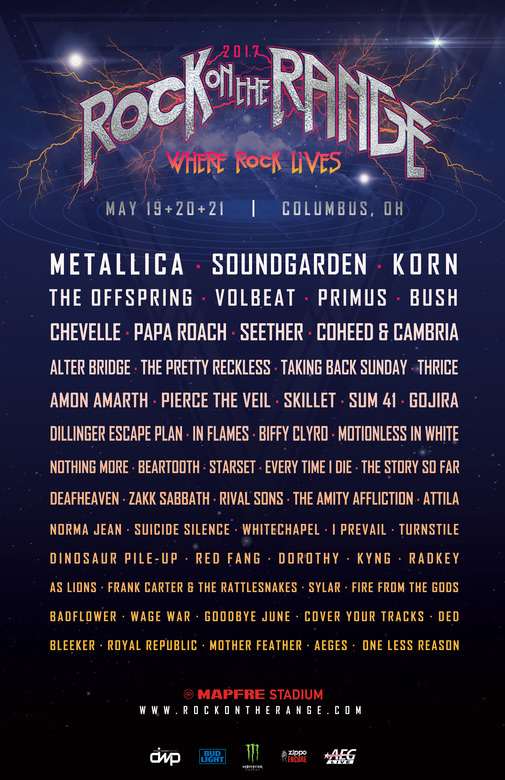 Rock on the Range—fueled by Monster Energy—is billed as America’s largest and most acclaimed rock festival. The festival will also feature in 2017 “The Music Experience,” art installations, and unique on-site activities over the course of the festival’s three days. Tickets for the 2016 festival sold out more than two months in advance of the festival. It marked the fourth consecutive year the festival has sold out in advance. Weekend Field, new Weekend Field VIP, Weekend Stadium and a limited number of Weekend Stadium 4-packs are available now for purchase. A layaway option is also available for concert-goers. That option allows audiences to split the cost of their ticket/ticket packages into four separate monthly payments. Fans can get a pre-sale password for Weekend Field VIP, Weekend Field GA, Weekend Stadium GA and Weekend Stadium GA 4-packs on the official Rock on the Range website, Facebook page and Twitter page. The ticket prices are listed below. General on-sale for tickets is Friday, Dec. 2 at 10 a.m. EST. Tickets will be available online at the festival’s website, at Ticketmaster locations and the MAPFRE Stadium box office. Audiences who want an even more special concert experience can purchase the new Uber Ranger Camping Package. The package includes amenities for four people such as luxury RV on a double campsite at the Ohio Expo North Campground (May 18 – 21), a dedicated concierge with golf cart shuttle, 4 Weekend VIP Field Admission Tickets, a backstage tour, access to the stadium club (with catered lunch and dinner), access to the Side Stage Viewing Platform, access to the VIP Lounge and more. More information on the new Uber Ranger Camping Package is available here. Rock on The Range celebrated its 10th anniversary in 2016. More than 120,000 people attended the festival from around the world. As part of its 10th anniversary celebration, Columbus, OH mayor Andrew J. Ginther and the Columbus, OH city council presented festival organizers with awards of recognition. A resolution was also announced from the Franklin County Board of Commissioners acknowledging the festival’s economic impact on the city. The commissioners pointed out in their resolution pointed out the festival brought in more than $140 million for the city over the course of its ten years in the city. Rock on the Range is produced by Danny Wimmer Presents, AEG Live and MAPFRE Stadium. It is supported by Monster Energy, Bud Light and Zippo. They and other partners will feature interactive experiences, meet & greets, and other special fan engagement opportunities throughout the festival.